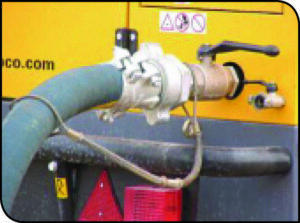 A pressurised air hose, could cause the hose assembly to whip with extreme force due to the sudden release of energy, in the case of hose failure or accidental uncoupling. In the event of the hose whipping, a situation can be lethal and could cause a potentially dangerous situation. To prevent such a situation from occurring, a whip check (Air Hose Safety Cable), has been designed to ensure the safety of workers, prevent injury and possible infrastructure damage. Our Cable socks are manufactured from galvanished steel and are available in a variety of styles. As a result this makes it the efficient piece of equipment for pulling cables in trenches and buildings. 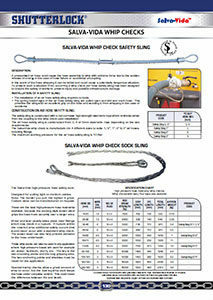 The Salva-Vida high-pressure hose safety device. Designed for pulling light to medium cables. Note : The harder you pull, the tighter it grips. Custom sizes can be manufactured on request. These are the best high-pressure hose restraints available because the stocking style woven steel grips the hose more securely over a larger area. Wear and tear usually take place near fittings, which may result in a rupture. If rapture happens within the covered area, additional safety occurs that would never occur with a standard whip check, the woven steel can also help prevent abrasion to the hose underneath. These Whip socks can also be used on any application where high-pressure hoses are used, air, water, hydraulic, slurry, etc. The key is the two mounting points and the long gripping area. The two anchoring points and shackles must be rated for the application. Standard whip checks allow a great amount of whip to occur, but the dual leg Whip sock keeps the hose under complete control. This could mean the difference between life and death.